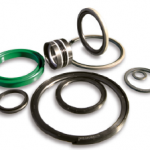 Elastomer seals are functionally reliable components of fluid engineering equipment and systems. Their advanced level of sealing technology is the result of many years of development and field experience gained in the various sectors of mechanical engineering. Hydraulic sealing systems are used in a wide range of different applications, from construction machinery, which has to perform under toughest pressure, temperature and media conditions,all the way to industrial water hydraulics in pressure intensifiers operating under extreme requirements with regard to lubrication, wear and corrosion.